Mourners have gathered at the home of the late music icon Dorothy Masuka in Johannesburg to convey their condolences to her family. Masuka passed away at the age of 83 in Johannesburg on Saturday surrounded by her family. Congress of the People says it shares the pain with the Masuka family and the industry. It says Masuka might be gone but her music will live for ever. The Democratic Alliance, the Inkatha Freedom Party, United Democratic Movement and the African People’s Convention have also expressed their condolences to the Masuka family and the music industry. Another singer Mara Louw spoke to the SABC outside Masuka’s Johannesburg home. 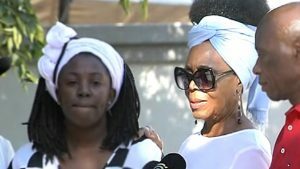 The post Mourners pay their respects at Dorothy Masuka’s home appeared first on SABC News – Breaking news, special reports, world, business, sport coverage of all South African current events. Africa's news leader..